Lately there seems to be a trend in Italian power metal circles for things arctic in their coldness and regal in their genetic extract, at least insofar as a couple of highly impressive outings by younger bands of said scene in 2018. The somewhat longer running Kalidia, which sports a somewhat more Gothic-tinged but largely heroic flavor of female fronted power metal hit pay dirt not long ago with a fine outing in The Frozen Throne, but what is perhaps slightly less known is that an even younger act in Frozen Crown fielded a similarly strong and styled outing earlier in the year in The Fallen King. Though both bands and their resulting sounds are fairly similar, the latter and their debut album have a generally faster speed metal base to their craft and also a more technically advanced demeanor owing to band founder and multi-instrumentalist Federico Mondelli, who handles guitar, keyboard and additional vocal duties of both the clean and harsh persuasion to help mold a sound that is fast and furious enough to rival Gamma Ray and Stratovarius at their most intense, but also stylistically nuanced enough to lend a comparison to the likes of Dawn Of Destiny and Epica at certain points. While the driving force behind this entire outfit is the songwriting and multiple performance contributions of Mondelli, it would be a mistake to gloss over the rest of this band as being mere followers of his lead. Principle vocalist Giada “Jade” Etro, who has already made a name for himself fronting the Croatian Gothic/doom metal act Ashes You Leave, is no slouch by any stretch of the imagination and offers up somewhat more amazonian take on the role of principle singer compared to Kalidia’s Nicoletta Rosellini and the legions of recent projects coming out of Europe lately that have been taking heavy cues from Elize Ryd and Simone Simons. Likewise, the drum work of newcomer and unknown quantity Alberto Mezzanotte presents a competent kit man able to handle the intense speed and precision that comes with the style, and his fellow rhythm section contributors in bassist Filippo Zavattari and guitarist Talia Bellazecca contribute a solid performance that provides a thunderous foundation under which the two main attractions can function. It’s an overall heavier and more aggressive sound that results when compared to most of the Italian power metal scene, occasionally resembling the variety that comes out of Germany and Scandinavia at times where the lines between power metal and melodeath are a bit more blurred. Though the general tone of this album is on the more aggressive side relative to others with a similar vocal arrangement, this is a band that also understands the value of mixing things up rather than just going for the jugular at every pass. Not shying away from embracing the more accessible, mid-paced rocking character that often accompanies the power metal template, a handful of catchy bangers like “To Infinity” that crosses similar territory to the mainline melodic power with a dose of pop that Metalite deals in and the driving, Nightwish-like symphonic number “I Am The Tyrant” are among the chapters in this cold royal tale. Balladry with a folksy twist are not outside of this outfits purview either when accounting for the serene interlude “Chasing Lights”. Yet when all is said and done, the real goodies on here prove to be the speed-infused numbers, which come in a fairly varied package. On one end of the spectrum is are catchy, Stratovarius-oriented sing-along anthems like “Kings”, and full blown riff happy speeders like “Fail No More” and the rather unlikely speed metal candidate for a promo video “Everwinter”, while on the other are a handful of harsher, almost thrashing quasi-melodeath bruisers in “The Shieldmaiden” and “Netherstorm”. The current fad alluded to earlier of winter and royalty that is represented in these two bands may seem to have been a mere observation of their similar monikers, but truth be told, it’s actually a good analogy regarding the relationship between this Lombardy-based powerhouse and its somewhat lighter and more accessible Tuscany counterparts. There is definitely a majestic to the point of regal demeanor to how both bands have honed their respective sounds, to speak nothing for the grand production value that adorns their respective 2018 offerings. While Kalidia presents something along the lines of a sage-like ruler gifted in both storytelling and magic, this outfit comes off a bit more the campfire tales of a warrior king and queen setting out to conquer the known world. One is not really better than the other, though they do end up coming off quite differently from one another, and both are definitely something well worth checking out for those who run in power metal circles. But for those who want something with a bit more bite to it, lining up a bit more with the rugged German sound that doesn’t really pervade much of the female fronted side of power metal, this band represents the preferred frozen kingdom. 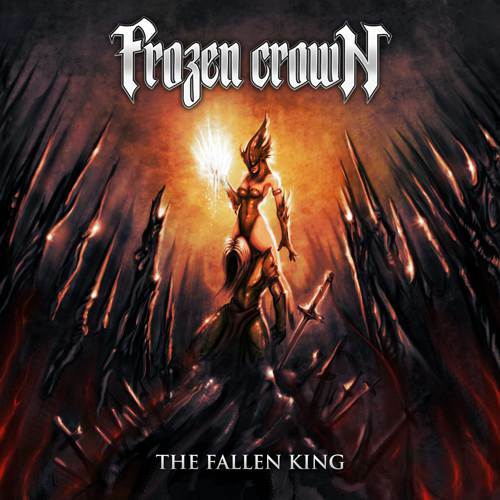 This entry was posted in Power Metal, Reviews and tagged Ancient Bards, Frozen Crown, italy, Kalidia, Lombardy, Milan, power metal, The Fallen King.